The iPhone 6s brings the long overdue camera resolution upgrade. After sticking to an 8MP sensor for four generations, Apple finally upgraded the iPhone's main camera to a 12MP imager. The front camera has received an upgrade to to 5MP as well. Both sensors retain the same F/2.2 aperture. The more powerful chipset and the new 12MP sensor also allows the iPhone 6s to capture 4K video recording among other new modes, plus it enables the so-called Live Photos. This is a familiar feature from the first HTC One - the camera captures 1.5s video either side of the moment you hit the shutter and saves it as an animated photos. There is no magic here, this is actually a 3s 1440x1080px video with sound, captured at 14fps. We are clarifying this in case you've expected gifs or similar formats. Those small files are usually 3 to 4MB of size and if you own a 16GB iPhone 6s, this may turn a problem for you rather quickly. The good news is this new format is compatible with the Mac OS X El Capitan and all Force-enabled Apple devices will support the Live Photos (for now those are the MacBook Pro 2015 models, the new MacBook 12" and the iPhone 6s duo). The front camera, as we said, is now 5MP, supports Auto HDR, and 1080p video capture. It can also use the screen as 'Retina' flash - the screen goes all white the moment you hit the Camera shutter, with brightness 300% higher than the usual maximum. This helps if you are shooting indoors and up close. The front camera is fixed-focus, but you can control and lock the exposure setting with tap and hold. The camera interface is the same as before. If you tap to focus the phone will give you control over exposure through a slider. This way you can conviniently adjust exposure compensation depending on the scene. You can lock the focus and exposure as well. Along the left side of the camera viewfinder you'll find controls for switching to the front-facing camera, setting up a timer (either 3s or 10s), choosing the HDR mode (Auto, off and on), turning Live Photo on/off and a settings for the flash (Auto, on or off). On the right side on each side of the virtual shutter button you get swipe controls that will take you into the photo, square and pano mode on one side and video, slow-mo and time-lapse. To activate the Burst mode you just need to press the camera shutter longer. Despite taking four years to add a 12MP sensor, the shots snapped with the iPhone 6s aren't quite as impressive as we hoped. The resolved detail is good, but it's not dramatically better than what the iPhone 6 offered and post-processing is rather heavy-handed - as noticeable in the sharpening halos and the prominent noise. Automatic exposure is a bit too overeager, which at times results in overexposed shots. Now the good news - the colors and contrast are great, while the dynamic range is simply great. We've turned the Auto HDR off and yet the images came out great, which is really something given the tough weather conditions. If it were 2014 we might have considered the samples among the best in the market, but today with great Galaxy S6 generation cameras and the impressive Xperia Z5 sensors, we just can't rate the iPhone 6s camera so high. It's good, but not quite the best. We shot with the iPhone 6, iPhone 6s and the Galaxy S6 edge+ side by side, so you can compare the samples. Despite having a narrower field of view, the two iPhones can't quite match the Galaxy S6 edge+ resolved detail. And we are not even shooting in conditions where the Galaxy's bright F/1.9 aperture would make a difference. And some more comparison between the Apple iPhone 6s and Galaxy S6 edge+. We tried a few HDR samples as well and they turned fine - they bring more detail in the shadows, without overexposing the highlights or sacrificing fine detail. Finally, the iPhone 6s, thanks to the bigger sensor, offers even bigger panoramic images. Those still cover about 180-degrees, but now they can go up to 15,000 x 4,000 pixels or 60MP. The stitching is great, there are no artefacts, the dynamic range is amazing, and the color rendering is good, too. Those didn't turn out over exposed as the still images and generally are among the best panoramas we've seen. We snapped a 5MP picture with the front selfie camera, in case you are interested in its quality. The resolved detail isn't that high, but it's certainly an improvement over previous gen iPhones and will do just fine for the social networks. You can use our picture compare tool to put the iPhone 6s camera head to head with other phones. Thanks to the higher-resolution sensor the new iPhone 6s is now capable of recording 2160p videos at 30 frames in addition to 1080p capturing at 30 and 60 fps. There is a new mode as well - 1080p at 120 fps for slow motion purposes, in addition to the 720p at 240 fps low-mo videos. Naturally, there is a time-lapse option as well. The camcorder UI is as simple as it can get, offering nothing but the flash setting. You can find the resolution switch in the Settings menu instead of having a shortcut in the viewfinder, which is somewhat annoying. Update, October 31: We've just added a video comparison between the iPhone 6s and 6s Plus, which shows the benefits of optical image stabilization. A feature exclusive to the larger model, OIS allows for even smoother hand-held videos on the iPhone 6s Plus. The otherwise excellent output of the 4.7-inch model is no match for the results delivered by a true hardware solution. The 4K videos carry a bitrate of around 51Mbps, but audio is subpar recorded in mono at 81Kbps in AAC format. The 1080p videos at 30 fps have a bitrate of 17.6 Mbps, keeping the same audio, while the 60fps ones came out with 26Mbps bitrate. The 4K videos are slightly less processed than still images - there is some noise, but less over-sharpening while the detail is decent if not quite class leading. Dynamic range is once again impressive and the frame rate is pretty steady, but the mono audio is disappointing. The 1080p videos at 30 and 60 fps are great, well stabilized thanks to the software stabilization, with great amount of detail, fine colors, steady frame rate and superb dynamic range. Once again - the audio is just mono, which is rather hard to swallow at this price point. You can download the untouched 2160p at 30 fps, 1080p at 60 fps, and 1080p at 30 fps videos. 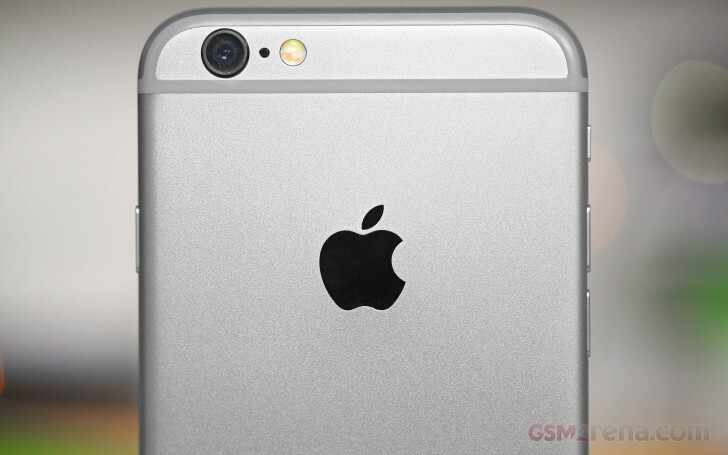 The Apple iPhone 6s is ready to meet the competition in our Video Compare Tool.